How does new hero Ana fit into the Overwatch metagame? Pharah's mom has got it going on. When you think of a hero you might not think of a sixty year old one-eyed mother with a rifle, and that’s why you don’t work at Blizzard. Less than two months after launch, this week Overwatch sees the introduction of a new hero, Ana. Missing her right eye and mother to the jetpack-wearing, rocket-slinging Pharah, Ana is bound to shake up the competitive Overwatch scene. She’s the breath of fresh air that support players were waiting for and an important addition to the game’s lore for everyone else. The question is: how does Ana’s arrival affect the way we play Overwatch? Ana has a few unique abilities. Her main weapon, Biotic Rifle, is a sniper rifle that does damage over time if you hit an enemy and does healing over time if you hit a teammate. Her sidearm, Sleep Dart, is a single-shot projectile that will put any enemy to sleep for five seconds or until that hero is damaged in some way. Ana’s Biotic Grenade is a projectile that can be used at an incredible range. When enemies are hit by her grenade, they can’t receive any healing for five seconds. Teammates caught in the Biotic Grenade’s blast instantly get healed for 100HP and receive bonus health from other healing abilities. Last but most definitely not least is Ana’s incredible ultimate ability, Nano Boost. It can be applied to a teammate to boost their movement speed, damage, and damage resistance. A Genji, Soldier: 76, Reaper or Winston with the Nano Boost buff will eat through an entire enemy team without looking back. Ana has a few game-changing abilities, so how do you best make use of all of this power? First off, you’re a support player who should be focused on keeping your team alive. Try getting into a position where it’s easy for you to see your team but hard for the opponent to see you. During large team fights, this requires distance to make sure the opponent can’t easily take you out. If a Tracer or Genji get close to you, you’re going to get ripped apart and Ana can’t easily get away. Try using your Sleep Dart on opponents with their ultimate ability up and your Biotic Grenade on important targets that your team is going to try to kill. If the enemy is doing a lot of damage to all of your teammates, use your grenade to heal them quickly. You can throw the grenade from quite a range so don’t worry about needing to close the distance. Your Biotic Rifle doesn’t only heal, it can also do damage, and quite a bit of damage at that. While healing should be your priority—you want to keep your team strong and healthy—you should be using Ana’s offensive abilities as well. Her sniper’s scope is very quick and, unlike Widowmaker, no charge up is required for her to do maximum damage. You’re going to most likely be aiming in the direction of the fight anyway, so you might as well try to get a couple shots into your enemies when nobody in your team requires healing. Her ultimate, Nano Boost, is best combined with one of your offensive heroes’ ultimates. A Genji with Nano Boost and Zarya’s shield bubble is virtually impossible to kill and constitutes an ‘overpowered’ combination in any sense of the word. As Ana, it’s important to communicate well with your team. You need your teammates to know that you’re going to give them Nano Boost or they might realize it too late, putting them in a position where they can’t use it as well as they otherwise would. What does she mean for the meta? 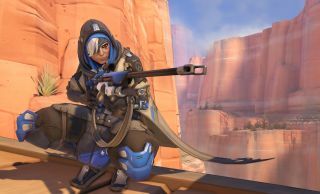 Ana is the first hero to be introduced after the launch of the game, so it’s not a surprise that there were high expectations for her. Combined with a rather stagnant metagame in the pro scene—where Mercy, Lucio, Reinhardt and Roadhog were simply required for a team to perform—places pressure on her design. Ana couldn’t be impactless, but she couldn’t be essential either. Unfortunately, the latter seems to be the case. As it currently stands, Ana’s ultimate ability is in a state where any skilled offensive player blessed with it becomes unstoppable, unless—you guessed it—the opponent can use their Ana’s sleep dart to temporarily knock out the now stupidly-strong hero for the duration of the Nano Boost. This means that if one team has an Ana, the other team needs to have one as well. In the tournaments that are already being played among the best players, we’ve seen team fights come down to who has the ultimate advantage a little too often. Generally, the team who can use two or more ultimate abilities at the same time will win a fight. With Ana, this just gets worse. Waiting for Ana and Soldier: 76 to both have their ultimate abilities up and then attempting to take a point is a perfect way to bust your opponent’s defenses without ever having to aim or think. There are advantages to having Ana in the meta, however. For example, if you can use your sleep dart to take out an opponent’s Mercy, she might not be able to resurrect her team in time to affect a teamfight. This means that Mercy might not even appear in the new meta—after all, teams have a new healer with an ultimate that can turn fights around completely. Ana is now playable on the official Overwatch servers. While even professional players are divided when it comes to her role in the meta game, it’s clear she’s going to have a tremendous impact on both casual and competitive play. As we’ve seen in the past, it’s likely Blizzard will be tweaking Ana and other heroes until they’ve found her sweet spot, so enjoy slicing through an enemy team while you still can. Ana’s fate might be no different than that of her nemesis, Widowmaker, once the nerfs start raining from above.